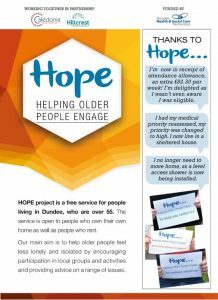 HOPE is a free service for people living in Dundee, who are over 55. The service is open to people who own their own home as well as people who rent. HOPE’s main aim is to help older people feel less lonely and isolated by encouraging participation in local groups and activities and providing advice on a range of issues. HOPE is funded by the Integrated Care Fund and has been developed by in partnership with Caledonia Housing Association.